Add: Guzhuang village, Shangzhuang Town,Luquan City,Hebei ,China. Bright green dark green density: 5.21. Melting point: 2266 ��. Boiling Point: 4000 degree. With metal luster, magnetic, strong hiding power, high temperature resistance, sunshine, do not dissolve in water, hardly soluble in acid, in the atmosphere relatively stable, in general the concentration of acid and alkali and sulfur dioxide gas had no effect, with good outstanding color quality and fastness. Used for smelting metal chromium and chromium carbide, enamel, ceramic, glass, leather, refractories, building materials, shading, organic synthesis catalyst, manufacturing, materials and printing banknotes Fast dedicated ink, metal polishing and grinding material, metal surface chromizing , magnetic materials and so on. Used in paint, ceramics, rubber, fine art paint and camouflage paint. Chromic acid, sodium dichromate (or potassium) and sulfur such as high temperature baking. High temperature, light, resistance to various chemicals. 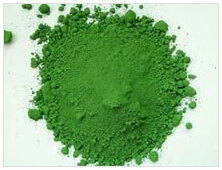 Compared with pure natural products to the near infrared reflectance of chlorophyll.